We have started our livestock contingent with chickens and ducks; eight Khaki Campbell ducks, three Barred Plymouth Rocks (one our future rooster), two Ameraucanas, and the unexpected addition of fifteen roosters believed to be Rhode Island Reds. The birds are two and three weeks old today, and have definitely outgrown their cardboard-box-brooders, but are still too young to be outside permanently. In fact, the poor ducklings were pretty desperate for some more space. Given that we are going to be brooding new chicks often, we decided to build some permanent brooders. We will often likely be brooding geese, chickens, and ducks all at the same time (and in varying numbers) so the idea of a modular system was soundly agreed upon. We will make four boxes, each box 4 feet wide, three feet deep, and two feet tall. The three foot sides are removable, allowing the boxes to be hooked together to allow for more brooder space. Currently we have made two boxes, and have hooked them together for the ducklings, and plan on making two more for the chickens this week. Even though we will be housing everyone together eventually, we are brooding them separately. Why, you might ask? As it turns out, ducklings are pretty wet and sloppy, and the chicks just don't appreciate it. Also, at three weeks old, the ducklings are almost three times the size of the chicks, and though as cute as buttons, they are comically clumsy. Quite simply, they'll squash the chicks flat, and leave them soaking wet, all the while looking over their shoulder as if to say, "Whoops, sorry!" Adorable, but not terribly healthy. We had a bit of a nervous to-do this morning. It appears that my daughter Susan (all of 7 years old) got up at dawn and decided to give the chicks and ducks their daily ration of dried mealy worms... and promptly spilled the entire container inside the brooder. When I discovered this fact, much later, I spent a bad few hours wondering about enteritis, but as I continually discover, these animals (when properly nourished and cared for) are quite a bit hardier than my research would originally suggest. Everyone is healthy and happy. We, too, found that ducklings and chicks could not be put in the brooder together. The ducks just grew so incredibly fast! And they were making a wet mess, necessitating new shavings every day. 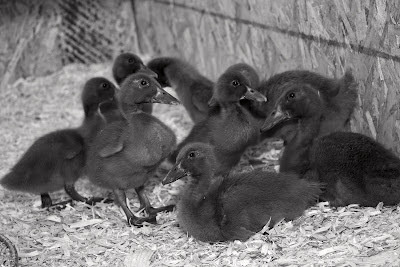 It was a revelation after several years with just chicks and one year of goslings. Good times! They are pretty sturdy little buggers, to be sure. If there is interest, I could draw up the plans for the brooder. It's pretty simple but, so far, appears to work well. If you know which end of the drill to hold one of these can go together in a couple of hours. 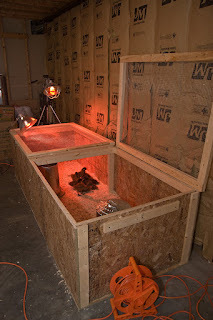 Thanks for sharing information about the DIY brooders. One can use the details to hatch both chicken and duck eggs at a time.